Clearly based on his manga appearance. 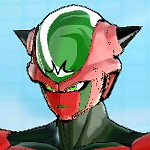 Tamashii pisses me off with this BS of making the manga colors the priority. Anyways, I can 100% guarantee he'll be an SDCC exclusive with the yellow and blue armor. That image is from the full color manga released a couple of years ago, a release that Toriyama had nothing to do with. Does anynone have a colored illustration of Nappa by Akira Toriyama himself? I don't think any exist, at least none in the actual manga. I don't get the choice for this color scheme.. 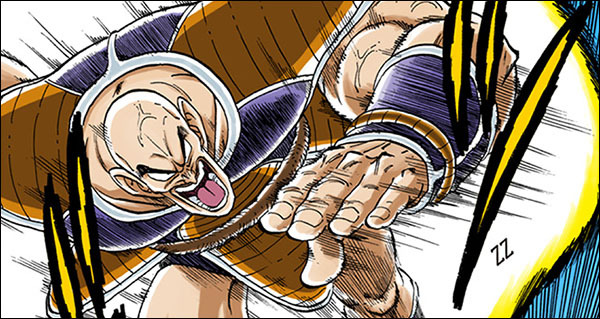 I prefer the manga colors on some characters but Nappa definitely isn't one of them. I always liked how his anime colors helped him match with Vegeta. To me it made sense for them to match because Vegeta being the prince wore royal colors so it sort of made sense for his partner to wear them as well. In the manga he shares the same armor colors as Raditz which makes him look very generic and unimportant. What importance did he hold other than being a survivor of a dead race? I don't know, he was Frieza's underling and Frieza hated saiyans so I guesss in reality Vegeta, Nappa and Raditz could be considered equals. 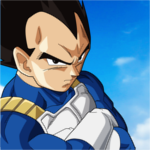 Vegeta's title wasn't important to Frieza so he was basically just as worthless as Nappa or Raditz until proven otherwise. But that's not the point, the point is I prefer the anime colors lol. He came to Earth and killed a lot of people... That's got to count for something. I mean... he made 16 on TFS' top DBZ villains list. That's got to count for something, right? Right? In all seriousness though, I do feel like Nappa is the main series Saiyan that I personally care the least about. Even Raditz, for as short a time as he was around, is more interesting in hindsight because of the familial ties he has with Goku, and the curb stomp he lays down on Goku and Piccolo is pretty insane. While Nappa may have had a bigger body count, his entire purpose is to underline how strong Vegeta must be. 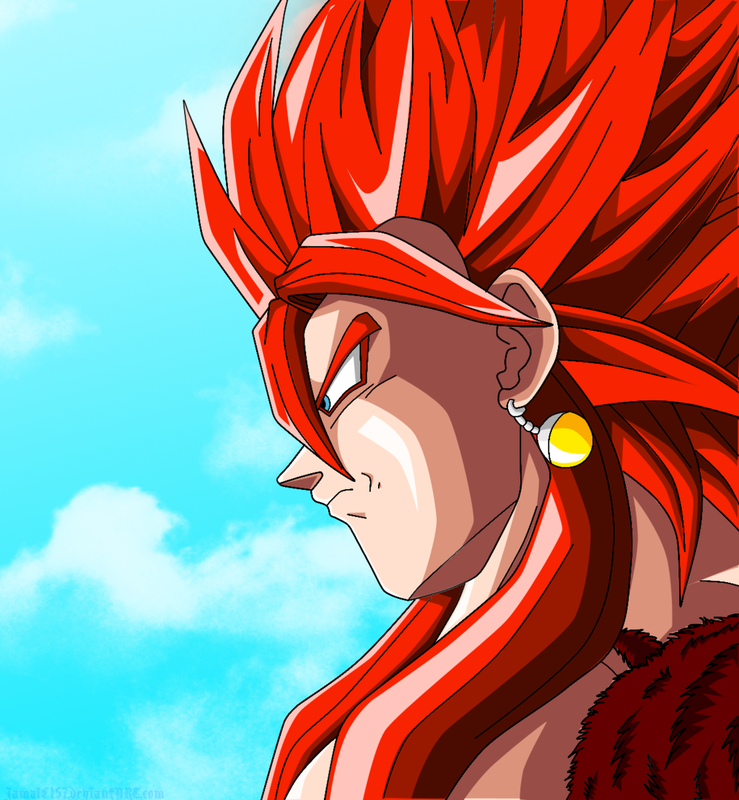 Majin Tomato Yeah I'm still surprised Raditz played such a small role in the series, he basically existed solely to give Goku more of a back story and open up more possibilities for exploration in the series. Like you said Nappa played an even smaller role, he was only in the series to make Vegeta seem more intimidating and show how much stronger Goku had become. He owes almost all of his fame to TFS. Hey timone317, I saw your post on Toyark about Nappa and was wondering why you think Nappa doesn't have a stoic face? I've yet to see one. There's a cocky grin, charging yell, and the shocked/"over 900" face but no head with a plain expression. checking again, it seems the product page mentions 3 replacement faces, maybe they just haven't shown off the normal face. If so, great. Yeah, I noticed the official product details says 3x interchangeable heads. I know a few previous releases mentioned more faces in the description but never showed them. So hopefully we'll get that stoic face. While he looks great for the most part. I really wish he had removable armor and was anime colors. Also, something about his legs bothers me. I can't pinpoint exactly what it is but they just look off. I'll probably still get him though. He pretty much salughtered all of the Z fighters. Nappa cemented his legacy in DBZ villainy long before TFS. He was always a favorite of mine. I like TFS, but I get really tired of their fans. tsarquise If having a high body count determined how important/iconic a Dragon Ball villain was then Majin Buu would be more iconic then the likes of Frieza. In anime/manga personality is everything when it comes to villains and that is something Nappa was severely lacking in. Don't get me wrong I don't hate the character I just don't think he was very memorable compared to other villains. You seem like a really cool guy but we both obviously have very different opinions, so let's just leave it at that before we get too off topic. After all this thread is about the figure and not the character himself. I took that more as Saiyan culture where a broken Saiyan should be put out of their misery because they don't have the ability to fight anymore. his tail probably doesnt come loose doesnt it? Based on the images it looks like it is a separate piece at least (the shot of him in the fighting pose has the tail resting higher than it is in the regular standing shots) and we see the seam in another, but I dunno how removeable it is. I think he'll only come with 1 tail which will be the wrap around type. Maybe Tamashii Nations will release a Nappa without armor and include a loose tail.